I did an interview about my job as a writer with Clash, a website for Christian teens. The work I do is more than “just a job” to me. 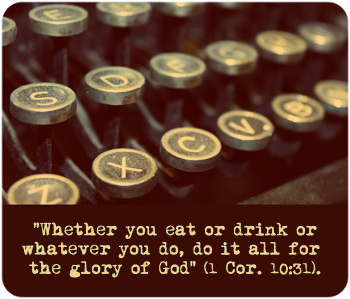 My writing is a ministry, because ministry is service, and every aspect of our lives is to be a service that glorifies our Lord: “Whether you eat or drink or whatever you do, do it all for the glory of God” (1 Cor. 10:31). Give us your job description in 25 words or less. To help people see the unseen, in my writing and speaking. That God would use me as his instrument, with purity and passion, to represent accurately His truth and His greatness. To elaborate, it's to probe beneath the surface into the deep longings of people, then to open a door into the invisible spiritual realm so people can see ultimate realities (including God, angels, demons, Heaven and Hell) with the eyes of faith and imagination. Once you catch a glimpse of the other world, the real world, you are weaned from the illusion that reality is limited to our five senses. You can't help but live differently once you learn to see differently. My life verse is "We look not at the things that are seen but the things that are unseen; for the things that are seen are temporary, but the things that are unseen are eternal." (2 Corinthians 4:18). Describe a typical workday. I usually work in my office, eight feet behind our house. The days seem crowded with responding to people in emails and phone calls, so I do most of my writing later, after Nanci and I have spent the evening together, and she goes to bed. She’s often in bed by 9:00 and I’m usually up until 2AM, sometimes 3, when friends and co-workers and readers are asleep. So there are no interruptions. What led you to realize that you wanted to do this type of work? My writing stems from a lifelong love of reading, beginning when I was a child. I devoured comic books, science fiction and fantasy short stories and novels, and Greek mythology. I loved having my imagination stretched. Instead of confusing me about reality, I think it helped me see reality in deeper ways. God used all that to prepare me to hear the gospel as a teenager, and respond to Christ. Ultimately, loving to read helped me understand writing, what works and what doesn’t, what touches the heart and draws people toward Christ. When I was in Bible college, one of my favorite professors jotted a note on a theology paper I’d written. He said, “You should consider being a writer.” I never forgot that comment, and it has often made me think about the power of our brief words of encouragement. Did you have any heroes or mentors in your industry that you admired? C. S. Lewis, A.W. Tozer and Francis Schaeffer were spiritual mentors to me. Tozer didn’t just speak the truth; he spoke it in penetrating ways. He was an editor and a wordsmith. Lewis showed me how the same mind could produce piercing nonfiction and imaginative fiction. What type of education or training was required to land your job? I received a bachelor of theology and M.A. in Biblical studies from Multnomah University, and also studied at Western Seminary. I’ve taught part-time at both schools. What do you love most about your job? I love reading, researching, analyzing and using my imagination. I have labored at improving my writing skills. I ask God for ideas and help, and I often sense Him answering those prayers in the middle of the night when I feel like I’m getting nowhere. Then the breakthrough comes. It’s the Lord. Whether we build or draw or fix things or make a home for our families, God wants us to yield our gifts to Him, and depend on Him for the next step, even the next breath. I don't always succeed, but that's what I seek to do in my writing. And while writing is sometimes very hard work, I love it. What one part of your job do you wish you could hire someone else to do? Keep my office organized, handle office details, take care of most of my email. I have two assistants who do a great job but since we work out of separate offices I often do extra things related to my home office. Other staff of Eternal Perspective Ministries help me in innumerable ways, including extracting portions I’ve written in books, articles and emails, and placing them on my Facebook page and Twitter. What advice would you give to teenagers wanting to get into your field of work? Our worldviews permeate our writing, and if all we soak in is popular culture, a few hours a week at church won’t be sufficient to give us depth and durability. We need to read great books by great Christian thinkers. Become an avid reader of the Bible and good books (all kinds of books, fiction and nonfiction). Take writing classes, attend writing conferences, write smaller projects and try to get something published such as a magazine article. Don’t buy the myth that writing is easy. It’s not. Some people act like it’s not a real job. A physician might say, “When I retire I’m going to become a writer.” Well, if he’s not writing now, when he retires may be too late to become a good writer. I mean, what if I said, “When I retire from writing I’ll become a physician”? It takes decades and decades to become the best doctor you can be and multiple decades of writing to become the best writer you can be. Books that were easy to write are usually hard to read. Some writers seem so natural, so effortless. Don’t be fooled. It takes a lot of effort to appear effortless. With everything else competing for your readers’ attention, you must work to earn it. Many people say they want to write a book, but what they really want is to have written a book. Big difference! Never compromise on research. It’s the reservoir from which you draw your book, whether nonfiction or fiction. Make sure the reservoir is full! Always give readers a compelling reason to keep turning the pages. They have a thousand alternatives—why should they read your book? Give them uncertainty and create anticipation. “What’s next?” keeps them turning the pages, but predictability is fatal. Figure out the parts readers will skip over; then cut them out. How does your job allow you to use your God-given gifts? It affords me the time and opportunity to research, to close out the world and look at God’s Word and consider the most effective lines of reasoning or storytelling. Do you have any hobbies or off-hours pursuits that teenagers would find of interest? I enjoy playing tennis, often with players from the guys’ team at our local public high school, where I used to help coach. When we have opportunities to be in warm water I love to snorkel. And we have friends with a ranch in Texas where Nanci and I really enjoy four wheeling. Even though as Christians we affirm the reality of the spiritual realm, sometimes we succumb to naturalistic assumptions that what we see is real and what we don’t see isn’t. Why Do You Emphasize Eternity in Your Writing and Ministry? In this audio clip, Randy Alcorn answers the question, "Why do you emphasize eternity in your writing and ministry?"